Rouhani said Iran plans to stay in the nuclear deal — for now — despite U.S. withdrawal and sanctions. Iranian President Hassan Rouhani told NBC News Monday that he had no plans to meet President Donald Trump during his visit to New York, saying the United States had employed only threats and sanctions against his country. 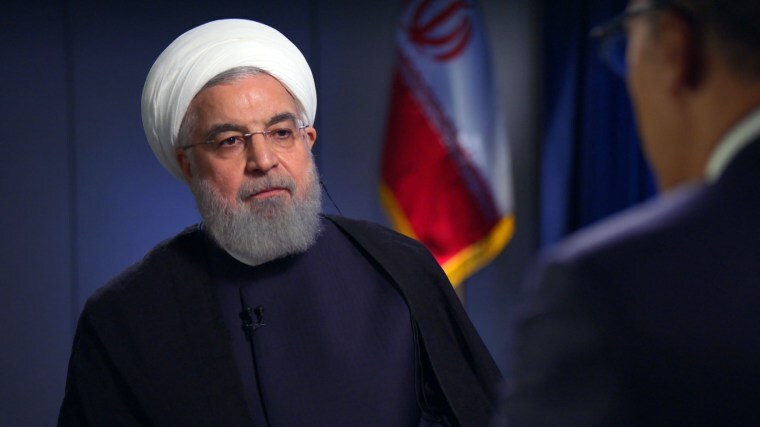 "There is no such program for a meeting," Rouhani said in an exclusive interview with "NBC Nightly News" anchor Lester Holt, saying conditions were not ripe for talks. Rouhani, in New York for the annual U.N. General Assembly session, accused the U.S. of adopting a hostile stance toward Iran and turning its back on diplomacy after its unilateral withdrawal from a nuclear agreement between Iran and world powers. "Naturally, if someone is keen on having a meeting and holding dialogue and creating progress in relationships, that person would not use the tool of sanctions and threats [and bring] to bear all of its power against another government and nation," Rouhani said. "That means that the necessary willpower is absent in order to resolve outstanding issues." After having met with North Korean leader Kim Jong Un in an unprecedented summit in June, Trump and his deputies have held out the possibility of talks with the Iranian president. A year ago, following a tough speech blasting Iran at the U.N. General Assembly, Trump reportedly asked for a meeting with his Iranian counterpart but was rebuffed. On Tuesday morning, however, Trump tweeted that he wouldn't be meeting with Rouhani now, but could "maybe someday in the future." "Despite requests, I have no plans to meet Iranian President Hassan Rouhani. Maybe someday in the future," he tweeted. "I am sure he is an absolutely lovely man!" Rouhani, meanwhile, ruled out Washington's diplomacy with Pyongyang as a possible model for U.S.-Iran relations, though he left the door open to other efforts to reduce tensions. "The North Korean model cannot be a correct model, because we cannot draw such comparisons. But certainly there are different models out there that can be used." As a precondition for any dialogue, Rouhani said the U.S. would need to repair the damage done by exiting the 2015 nuclear deal. "That bridge must be rebuilt," he said. The Iranian president, re-elected to a second four-year term in 2017 on promises of opening up the troubled economy to more foreign investment, portrayed the U.S. as diplomatically isolated over its withdrawal from the nuclear agreement. Rouhani said his country could withstand U.S. economic sanctions and called Washington's threats to choke off Iranian oil exports an "empty promise." "The United States is not capable of bringing our oil exports to zero," Rouhani said. "It's a threat that is empty of credibility. Perhaps on this path, we will sustain certain pressures but certainly the United States will not reach its objective." The 2015 nuclear deal, signed by the United States, China, Russia, Britain, France and Germany after more than two years of negotiations, imposed strict limits on Iran's nuclear program in return for lifting crippling international and U.S. sanctions on the country. Since Trump pulled the U.S. out of the accord in May, the United States reimposed a first tranche of economic sanctions in August and is due to reintroduce sanctions on Iran's oil and gas industry on Nov. 4. The other countries that signed the deal, including European allies, have stayed in the agreement, though major European firms have begun pulling out of Iran to avoid getting hit by U.S. sanctions. India, China, Turkey and other countries are seeking waivers or exemptions for the energy-related sanctions that are designed to squeeze Iran's oil exports, a crucial source of revenue for the Islamic Republic. During his visit to New York, Rouhani was due to meet leaders from the other signatories to the agreement to confer about how to keep the deal alive despite U.S. sanctions. In the interview, Rouhani said Iran would remain in the agreement, known as the Joint Comprehensive Plan of Action (JCPOA), despite Washington's withdrawal, as long as the other signatories held up their end of the deal to open the door to trade. "Until such time that our interests are guaranteed with the five remaining countries, we will remain within the JCPOA," Rouhani said, adding that "a one-sided agreement would be meaningless." Asked by Holt if Iran would fulfill threats to close off the Strait of Hormuz to oil shipments, Rouhani refused to rule out possible Iranian action to shut down the strategic waterway in response to U.S. pressure. "If the United States wishes to use force in order to sanction the petroleum industry of Iran, it will certainly see the appropriate response," he said. The Iranian president added: "We do have the power to secure our own waterways and keep our waterways free." Asked if he was warning President Trump, Rouhani said, "This is not a warning. This is a reality. If the Persian Gulf waterway is to remain free and secure, it must remain so for everyone." Iran has previously threatened to close off the Strait of Hormuz at moments of tension with the U.S. The narrow waterway serves as a crucial transit point for oil shipments out of the Persian Gulf, and represents the most important maritime trade route for oil. Rouhani, however, did not specify precisely under what conditions Iran would possibly take action. Apart from slapping unilateral sanctions on Iran, the Trump administration has voiced support for anti-government protests and accused the Tehran regime of rampant corruption. But administration officials deny they are seeking to topple the regime in Iran. Rouhani's visit came as Iran and the U.S. traded angry words after an attack at a military parade on Saturday in the southwestern Iranian city of Ahvaz that killed 25 people. Before arriving in New York, Rouhani accused the U.S. and its allies in the Middle East of enabling the attack. The U.S. ambassador to the U.N. Nikki Haley then pushed back, saying Iran should "look in the mirror" for the causes of the attack. In his interview with NBC News, Rouhani condemned her comments. "Yesterday, one of the American officials clearly and openly supported these terrorists, and said that in Ahvaz if something took place, Iran must not seek the roots of that terrorist attack in other countries," he said. "If this is indeed so, if this train of thought makes sense, how do we apply the same logic to the terrorist attacks of September 11th?" Street protesters in Iran have denounced the government for spending large sums of money in the civil war in neighboring Syria in support of the regime of Bashar al-Assad. But Rouhani defended Iran's presence in Syria, saying it was at the request of the Damascus government, and that Tehran was ready to withdraw once a political settlement was in place. "Our presence in Syria has only to do with the will of the Syrian government," Rouhani said. "Whenever terrorists are defeated in Syria and terrorism ceases to exist in Syria, and the government of Syria has no need for us, then at that point our continued presence in Syria will not have any meaning or serve any purpose." Rouhani said events in Syria were moving in a positive direction, with the Assad government gaining the upper hand against opposition forces.